and rose petals drying on my homemade drying rack. Photo by Grey Catsidhe, 2016. The warm weather is here, and I’m working to improve my relationships with plants. I’m always learning about herbal properties, plant identification, methods of preservation, and various magical uses. My paternal grandmother started to teach me when I was little. She had a beautiful herb garden and apple trees at her home. Some of my favorite childhood memories are of our time exploring the garden together. Presently, I have various plants drying from my drying racks. Some will season food, others will become tea, some offerings, and many will serve multiple purposes! A basketful of freshly picked strawberries from a local farm. Photo by Grey Catsidhe, 2016. Today we went strawberry picking. It’s alway a lot of work but great fun! My daughter certainly enjoys it. 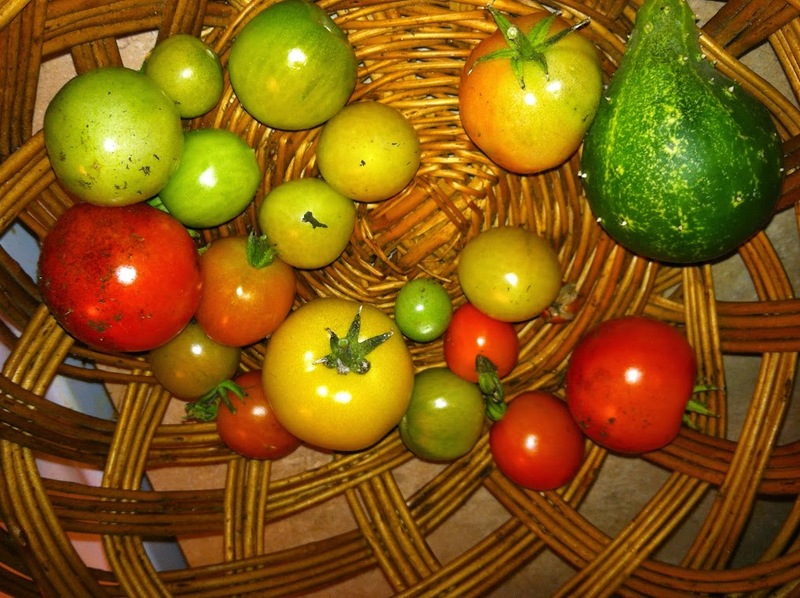 We picked three big baskets. As soon as I got home, I started to process them. I have several in the freezer and made some jam. I’m going to throw some on the dehydrator later. A friend suggested I make strawberry shrub syrup which I hadn’t ever heard of before, but I’m intrigued! Perhaps tomorrow. I may even have enough to make more jam! A few days ago, we had our first bonfire of the year at our home. We decided that we would toast some vegan marshmallows we had leftover from Bee’s birthday party. I taught Bee that we need young wood on which to place the marshmallows while we toast them. We brought an offering of water to the nearby apple tree. Bee reached up and asked permission without any prompting! She then held the cup of water up, presenting it to the tree. She poured the water and then I found suitable branches to cut. We gave the tree our thanks. I explained to Bee that I normally don’t harm trees, but sometimes young wood is necessary. I was really impressed with her respect and how easily the words came to her. I’m definitely a proud Druid mama! Hopefully the tradition of working with plants will continue in my family for another generation. Upstate New York is known for its delicious apples. Each autumn, orchards roll out their red, yellow, and green goodness, cider presses offer their ambrosial best, and folks everywhere delight at the numerous confections produced in kitchens across the land. When fresh apples appear in mounds at farmers’ markets and grocery stores, when the cider presses open, that is when autumn has officially arrived, and this little Druid rejoices! While I’ll join my fellow grovies on Saturday for a formal ritual to honor and thank the Earth Mother for her bounty, I’ve spent my Autumn Equinox eating a homemade meal with my little family and enjoying the harvest of apples – including some from a tree right outside my home! I’ve already dehydrated some for snacking. 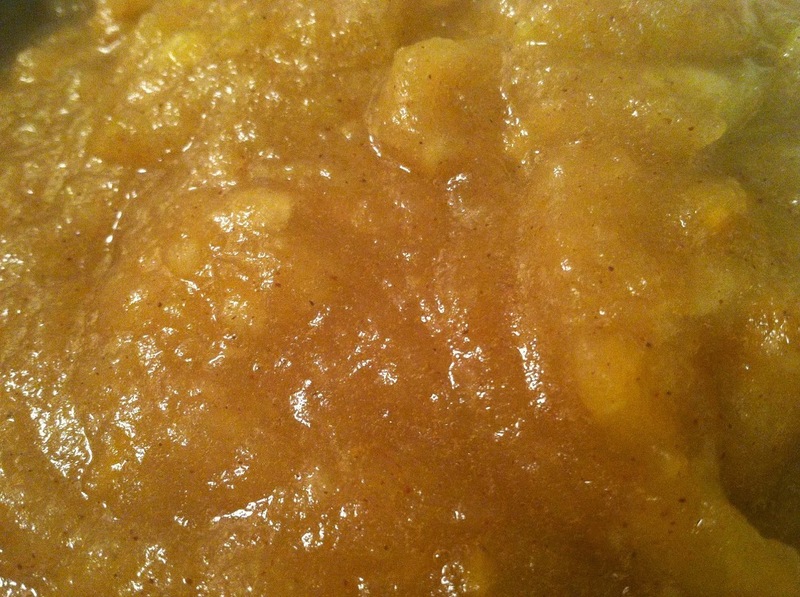 Today I decided to do something simple and quick – apple sauce. 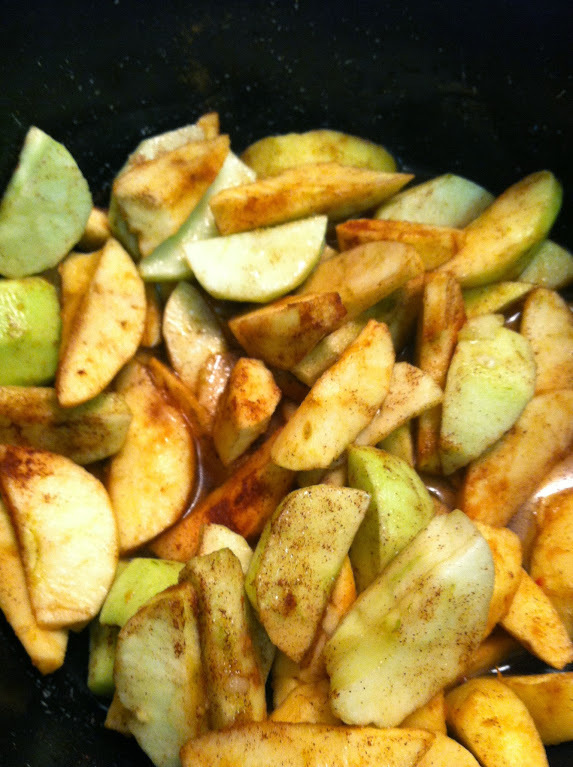 It’s such a simple dish – a large batch of apples, water, sugar, and cinnamon. Recipes say that last ingredient is optional, but you’re a strange one if you omit it. Blended together, the aroma wafts through the home, the most welcomed autumn incense you could dream up. While the plant world is dying or preparing for sleep, the smell of apples is youthful energy unleashed! Homemade goodness. Photo by Grey Catsidhe, 2014. Unlike store-bought applesauce, the homemade variety, fresh off the stove, tastes like apple pie filling without the crust. All the good stuff – the heart and soul of the autumn season. The only thing more gastronomically titillating is pumpkin pie filling. Oh, mama… Speaking of mamas, there’s something very motherly about apple sauce to me. Perhaps it’s because one of my first childhood memories is of watching my grandmother make it using apples straight off her tree – apples I helped to pick and sort. As my baby salivated and smiled at the sugary treat of apple sauce, I realized that I was passing along yet another North Country tradition, one that goes back generations to the Old World. 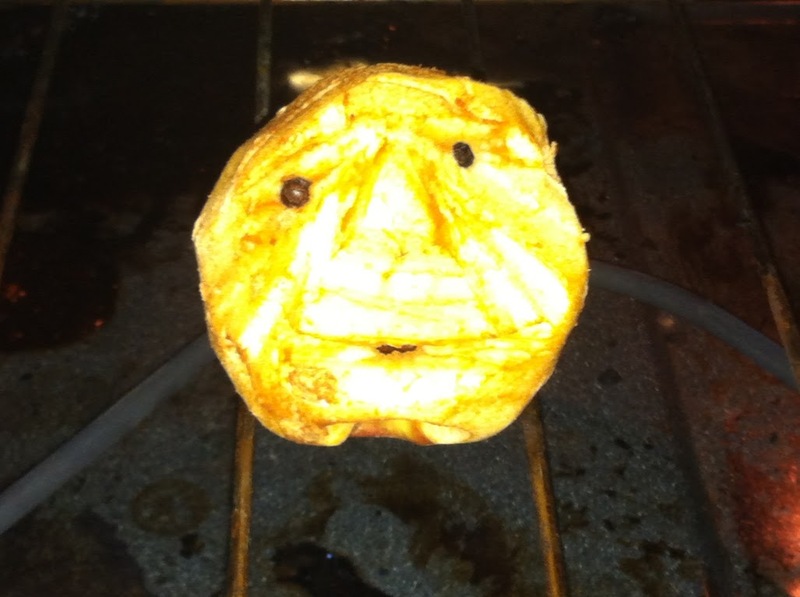 Drying apple head. Photo by Grey Catsidhe, 2014. Another apple tradition, one that I’ve never tried before, is drying apple heads to make dolls. As someone who enjoys making dolls and learning about traditional arts, I don’t know why it’s taken me this long. Using an apple that had a massive bruise on one side (normally I’m not a fan of wasting food, but this one was going to get thrown in a hedge anyway), I carved a face, inserted peppercorns for eyes, and placed in my oven on a low setting. 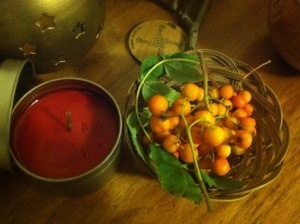 It’s still drying nicely, and my hope is to make an offering for our Autumn Equinox celebration this weekend. I hope your own harvest celebrations have been equally sweet and inspiring! May your harvest invigorate your heart, mind, and soul, and may it reconnect you to your Ancestors and the rhythms of Nature! Transplanted wild chamomile. Photo by Grey Catsidhe, 2014. Earlier I went out to lunch with my husband. We stopped in The Mustard Seed, a local health food store and cafe. We sat beneath a big poster displaying a variety of medicinal herbs. Weretoad asked if I had ever encountered chamomile in the wild and I said that I had not but would love to find it one day. Sometimes the Kindreds hear you. A delightful downpour welcomed me home after work this afternoon. Rather than rushing inside, I took a moment to revel in the cool relief the rain brought. I was rewarded with a welcomed sight – a few small patch of plants that looked like chamomile, growing right near my home! Some research confirmed that I had discovered wild chamomile – aka “pineappleweed.” The scent of it’s conical blossoms gave it its name. I decided to try transplanting a couple. Others online advised that I should trim the tops a bit to promote root growth after transplanting, so you won’t see the blossoms that gave it away in my photograph. I brought those in and promptly brewed a cup of tea! Well… after I gave thanks. I disturbed some ants while digging up my new plant allies, so I gave them a peace offering of sugar-in-the-raw. 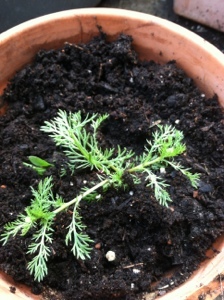 May the ants know my respect and the wild chamomile thrive both in and out of my pots! I’m grateful the Kindreds finally allowed me to find this chamomile. Clearly the time was right. I hope everyone is enjoying their late spring/early summer. I certainly am! This time last year, I was the size of a blimp, waddling everywhere, and reluctant to wander far for fear of falling or making my back ache worse than it already was. Ah, the joys of third trimester pregnancy… My self-guided foraging and herbalism studies went on hold until, well, this year! This year, I have some more freedom to move around and explore the forest and fields around my home. Bee is starting to find ways to entertain herself, so I have a little more time to develop my knowledge and hobbies (when I’m not preventing her from climbing onto shelves and tables…). 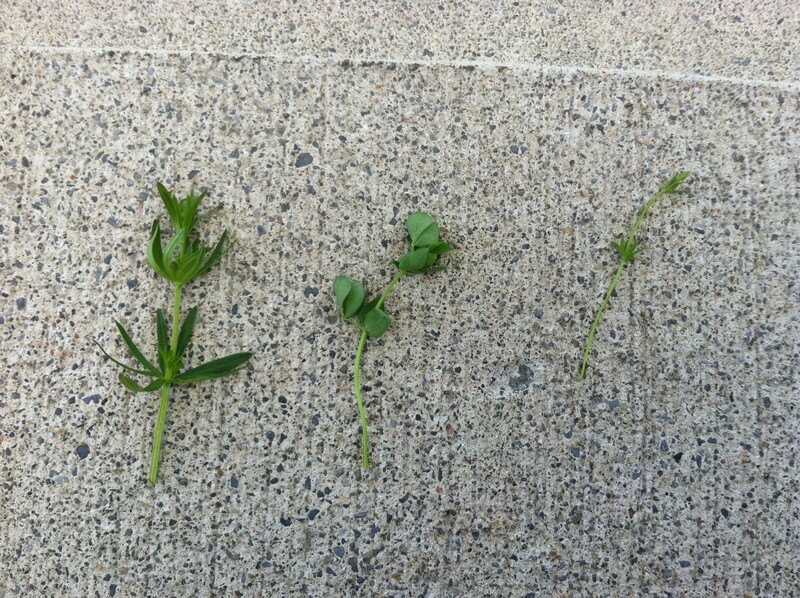 If only I had known last summer – there are so many edibles literally inches from my door! A few weeks ago, I shared my positive experience cooking with dandelions in cookies and fritters. Dandelions are very common and arguably the most easily recognizable edible you can forage, but don’t stop there! With the help of identification/ foraging books and websites that contain excellent written descriptions and photographs, you can add more delicious and healthful plants to your diet – for free. I came up with a fun and easy option to put everything together for a light lunch: Early Summer Greens on Toast. 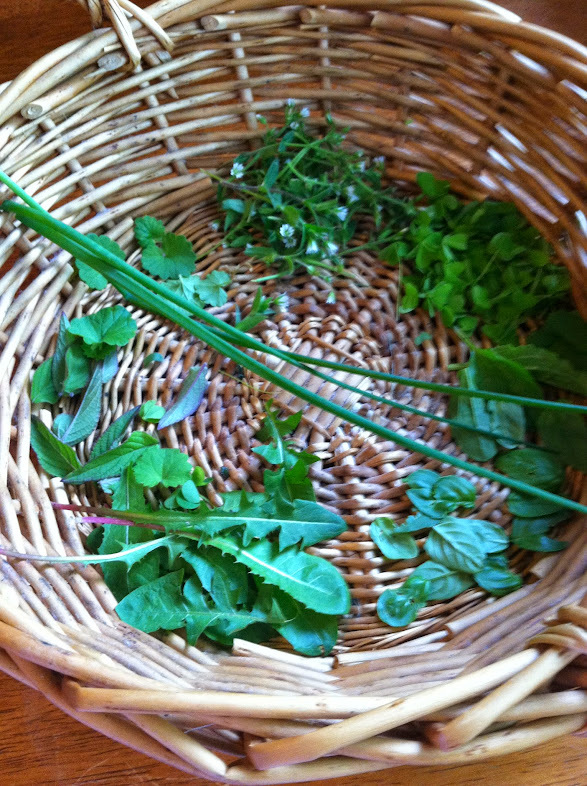 Along with the greens and flowers I foraged, I also include herbs from my garden, and some produce from the grocery store. Hey, I’m not entirely self-sifficient, but this is a start! Ahhh… fiddleheads… One of the many signs of summer. Something about their spiral adds a touch of Druidic whimsy to my cooking. I have yet to find them on my own. For now, I buy locally harvested fiddleheads from my grocery store. After washing everything and chopping the tomato, I sauté the lot in a shallow pan with olive oil. Cook on medium until the fiddleheads are tender. Greens reduce quite a bit, so if you want more, you’ll need to harvest much more than you see in my basket. 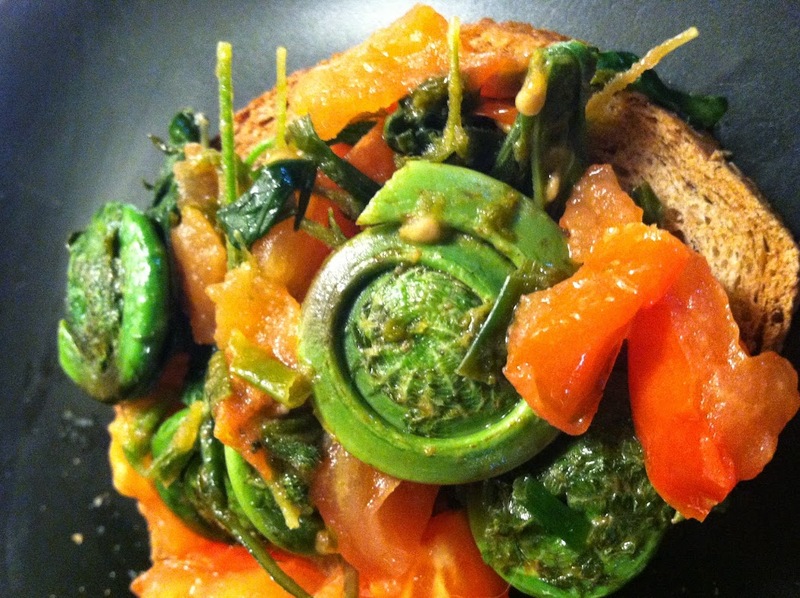 The fiddleheads add texture while the tomatoes add more flavor and color. The basil, chives, sage, and ground ivy add quite a bit of flavor themselves! My salt-loving husband never adds extra seasonings to this dish! Serve on toast to give everything a nice, crunchy base. Enjoy the taste and savor your growing knowledge of the land. Thank you, Nature Spirits! Yum! Photo by Grey Catsidhe, 2014. I’m one of those people who reads multiple books at a time, and you can bet that at least one title I’m working through is about herbalism or foraging. I just started Backyard Medicine: Harvest and Make Your Own Herbal Remedies by Julie Bruton-Seal and Matthew Seal. It’s a beautifully photographed guide featuring tips for identification, a bit of folklore, and recipes. With the forest and hedges springing back to life, a book like this makes me very excited! On Saturday I decided to do some scouting. I visited the forest and made offerings, then I observed, taking plenty of time to stop and soak up the sunniest spots as it was a very chilly, breezy day! Surprisingly, the trout lilies have yet to bud, and the red trillium has yet to make an appearance. Is it the chill in the air? The very wet start to the season? I was hoping to find chickweed and stinging nettled. I have yet to identify the former and may have found the later but I need to do more research and closer observation (with thick gloves). I also saw some other lovely plants, some that I need to identify and keep my eye on. 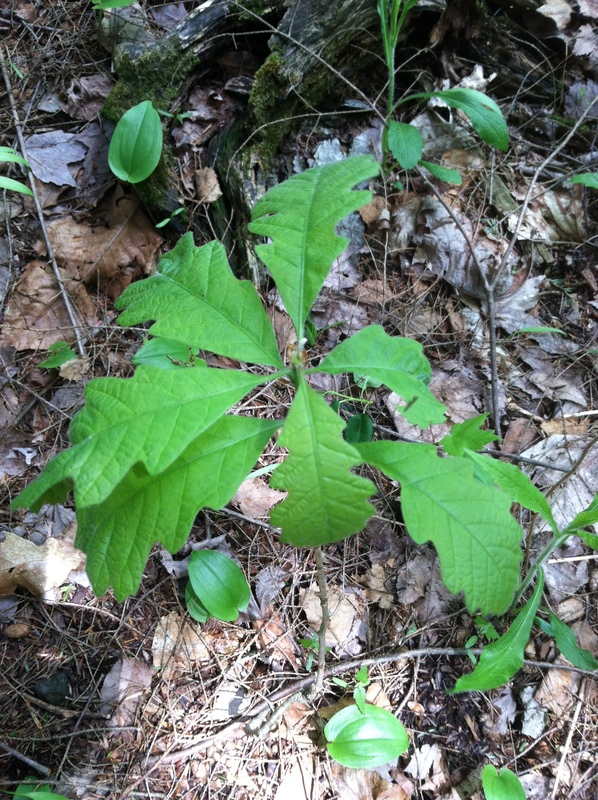 Others I knew right away and delighted in their appearance, such as this lovely white oak seedling. What a great omen for a Druid-in-training! Baby Oak – photo by Grey Catsidhe, 2014.